Friday, December 13, 2013 marks the last Colgate Day in the Year of ’13. This Friday, December 13, the Colgate community will put an exclamation point on the Year of ’13 with a Colgate Day celebration that reaches into hearts and homes around the world. The day begins at 6 a.m. Eastern time, when WRCU-FM kicks off a full schedule of special programming. Listeners visiting wrcufm.com or tuning to 90.1 FM in Hamilton will be treated to shows hosted by alumni, faculty, staff, and students. The day includes music with the likes of Sian-Pierre Regis ’06, Lin Brehmer ’76, Katie Bilik Sweeney ’82, and Doug Cowie ’99. Podcasters Kevin Heffernan ’90 and Steve Lemme ’91 will be joined in the studio by fellow Broken Lizard member Jay Chandrasekhar ’90 as well as comic actor Carrie Clifford ’93 and entertainment executive Eric Levy ’94. Can you believe that Vicky Chun ’91, MA’94 and Joe Castiglione ’68 will be calling former Colgate athletes to talk Raider sports? Faculty members Mel Watkins ’62 and Michael Coyle — alongside his co-host, Kara Rusch — will take to the airwaves with comedy, jazz, and classic rock shows, while Murray Decock ’80 shares an hour from his classical piano repertoire. Check out the full program lineup below. As WRCU plays in the background, alumni clubs will host more than 20 different celebrations across the country. Alumni, parents, and friends will gather in New York City, Philadelphia, Chicago, Boston, Cleveland, Dallas, Los Angeles, and cities in between. A full list of Colgate Day celebrations can be found on our website. Closer to home, students will be taking a special Colgate Day study break at midnight in the Case Library and Geyer Center for Information Technology; Merrill House will light up with Colgate spirit during a faculty tunk on Friday night, and the party continues at Donovan’s Pub until the bell tolls 12, bringing an end to this once-in-a-century commemoration. The university has also announced the Year of ’13 Challenge. If 1,300 alumni, parents, and friends make a gift of any size to Colgate before midnight on the 13th, an anonymous graduate will give $1 million to the university in support of financial aid. Anyone interested in joining the challenge can visit colgate.edu/makeagift or call 1-800-668-4428. 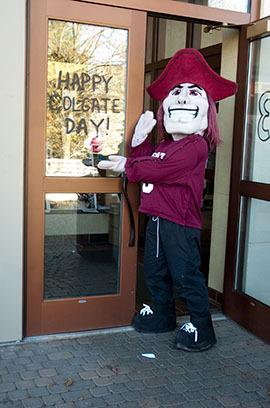 Visit colgate.edu or gocolgateraiders.com throughout the day for details as they develop — and be sure to tweet your Colgate Day messages to #ColgateDay. 8–9 a.m. Doc Miller What’s Up, Doc?